The first part of it was near a boat landing in a harbor town. The harbor looked like some place in the northeast US or maybe Canada. There was an old clapboard church painted primrose yellow and shuttered, that floated a few yards into the harbor near the boat landing, on pontoons. My thought was it had to have been built around 1850 or so. Interestingly, I found this: http://www.retronaut.com/2013/05/the-floating-church-of-the-redeemer/ The church I saw was less ornate, but of a very similar style. It burned in 1868. 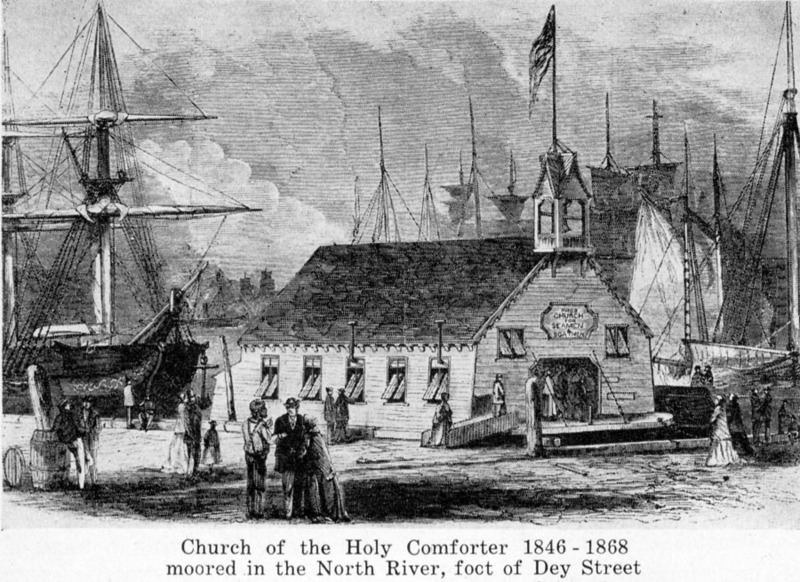 I also found a similar church called Church of the Holy Comforter that is closer to what I saw (less ornate and with shutters), on a site about seamen’s chapels. This one also didn’t exist after 1868. This was unexpected and sort of reinforces the idea that I was a sailor at some point in my life before John, perhaps before settling and becoming a stage hand. It also reinforces my suspicions of a past life connection to the northeast US, a place I’ve only traveled to once in this life. The second part of the dream had me walking along Sherbourne Road in Yeovil. The town was a weird amalgam of how it looks now (with paved roads and modern signage) and how it looked more than a century ago (not a single Peugeot dealership or ASDA in sight, and all the buildings were of a similar style so that the street had some continuity). It was a bright sunny day, all the shops were open, and people smiled to see me. I sat down in the main square, where the war memorial would have been, except there was a small green with trees and plants. I was shaded by a tree that was small, but very old (perhaps a wax myrtle or something along those lines). At the time I didn’t really question it but now that I think about it, the symbolism is obvious. It’s almost as if this was the Yeovil that would have existed in the present, if that war hadn’t happened. And the more I think about it the more I feel that the war was such a scar on the psyche of the Western world that its stain may have corrupted us all into beings who prefer to dwell among concrete, crass consumerism, and somber memorials. That’s the Yeovil of 2013 but it’s not the Yeovil that was meant to be. I have a profound sense of melancholy now, as if I’ve been shown the awful truth of the world we live in as something scarred, broken, and lost and I have this deep yearning to restore the world to how it was supposed to be, a bright golden future where people smile at each other in idyllic villages that never lost their best young men in a pointless war. I thought I’d gotten away from the shadow of that war… I guess a part of me never will. I have gone farther with my research into possible past lives than a lot of people have. And yet, I often wonder what drives me, why I can’t just let it go, why I insist on contacting people who might have known me, or asking weird questions of historians. I guess what it all comes down to is the age-old question of what happens when we die. I had gotten used to the idea that there is nothing after death and now I want to know if I was wrong because in truth, the answer really does affect me here and now. Let’s say someone takes exception to me for being born male and living as a woman. I have a one in twelve chance of being killed just for that fact. Add in some additional risk factors- poverty, being overweight, anxious/depressive disorders, and the inherent dangers of hormone therapy to name a few- and I’ll be lucky to make it to 60. I’ve taken some steps to reduce risks (most notably no longer drinking), but there’s only so much I can do. Sooner or later, this body will wear out too. How I spend the time I’ve got left wouldn’t change so much; I still will have to live as if my final breath is “game over” even if there is another quarter in my pocket. A life lost is a life lost, even if I can expect to reincarnate. I can’t go back and claim the Earldom of Salisbury, or John’s 1914/15 cross. Whether I come back or simply dissipate into nothingness, everything I had in this life will one day be gone. But before I commit to believing that, I’d like to have something really solid to believe in. I want to know for sure that something I have remembered is more than just a lucky guess or cryptomnesia, even if I can never prove it to anyone but myself. I don’t want to delude myself, or to believe the wrong things about where my soul is headed. Whatever happens the day I die, I want to die sure in what I believe. I think everyone does, really, but not everyone has a chance like this. Here I have this golden opportunity, a possible past life that ended a little over 3 decades ago. There are people alive who knew the person I might have been, and I have already had tantalizing leads to suggest that there is something to my memories. I feel so close to finally answering the question for myself. The letter I sent was returned yesterday, unopened and unread. I have one more lead on how to get in touch with someone who might know if my memories are correct. If I hear nothing from that lead by about February, then I’m not sure what I’m going to do. Appealing to the public carries a lot of risks but it’s tempting at this stage. I don’t want to be told I’m right unless I am, and I sort of dread being right in an odd way. On this blog, I have disclosed the details of three possible past lives and I have hinted at a fourth, which I am still hesitant to discuss in detail. However, you might also notice that there is another theme that has become quite common here: my attempts to work out exactly what these experiences represent. And while my conjectures have been numerous, I feel that they can be generally classified into three categories with problems endemic to each of them. The first I like to call the “Insanity Hypothesis.” That’s an easy one to explain; simply put, if this hypothesis is correct, I’ve simply had a series of psychotic episodes. This seemed to be borne out by the emotional nosedive I took after the more graphic memories I had of Ypres. However, my quality of life and emotional stability has actually improved somewhat since recovering from the initial shock of those memories, which makes psychosis seem unlikely. I also have the opinion of multiple professionals that these ideas are not psychotic in nature. The second hypothesis might be termed the “Stranger than Fiction” hypothesis. In simple terms, this means that whatever these experiences are (past lives, remote viewing of the distant past, or simultaneous existences in non-linear time), they are real and therefore deserve to be studied and learned from. The problem with this hypothesis is that I cannot find any solid evidence to tell me what these experiences actually are, only that they bear a close resemblance to actual historic facts. The third hypothesis I call the “Walter Mitty Hypothesis.” Simply put, if this hypothesis is true then my experience has been a combination of emotional immaturity and a tremendous intellect for constructing quasi-rational fantasies, and I am nothing more than a writer who told myself a story so realistic that even I believe it. This last hypothesis would seem the most likely, but to my mind there is one major problem: I don’t know if I’m that good as a writer. In fact, if the reception to my published work is any indication, I’m too much of a “close but no cigar” kind of writer who can write light and entertaining pulp fiction, but little else. I am often frustrated by my inability to run with the literary heavyweights of my era like Tom Wolfe and Thomas Pynchon; in reality I’m just barely a notch above your average romance novelist with plenty of pedestrian narratives and tired themes. I suppose, though, after convincing myself that I can remember lives strung across 800 years, it’s time to see if I’m really capable of telling a story that good whole cloth. I want to be able to make up stories about places I’ve never been and people I’ve never met that somehow turn out to be stunningly accurate. But already, I feel like I’m having to work up to that. I’m having to draw from my experiences and slowly wean myself off of them, and my one attempt at writing historic fiction based on a past life, I was told, reads more like an outline than an actual story; it seems when I deliberately spin yarns I’m just not as good at making them work. I’m not having flashes of inspiration where I see the story playing out as if it were a memory from many centuries ago. I feel frustrated and lost at times and I wonder if this is simply my own self-doubt and self-consciousness coming into play, or if I’m really not capable of telling stories like this one on any deliberate basis. But writing matters to me because if I can tell a better story than a string of past lives linked by weird coincidences and supported by historic facts, then I’ll know for sure if it’s possible that I could have made the whole thing up. If not, then I’ll have a pretty good indication that what I’ve experienced is probably genuine and a wonder to be cherished, even if it has been emotionally difficult. I might never know, and I might spend the rest of my life trying to figure this out… but maybe I can live with that. More than a year on, I’m still trying to make sense of my experiences. I’m more aware than ever, I think, of how precarious any condition of peace is when it comes to international politics. Nobody in the summer of 1913 saw what was coming in the summer of 1914, after all. Every bit of human history from about the time of Napoleon on seems to have been nothing but a series of loosely-connected wars that become worse and worse each time. But what can someone like me do about it? In another life, I joined the cause I believed in the most and died an arguably preventable death that did very little to advance that cause. In a life after that, I wrote about my experiences but had nothing but trouble, and nobody listened to what I had to say until I was long gone. So here I am, once again writing about the things that concern me, and feeling, once again, so painfully weak and impotent in the face of everything that’s looming over the horizon. World War 3? Check out the situation in Asia. Ecological collapse? Likely, if we don’t get our act together. Global plutocracy? TPP’s moving forward and Google’s investing in military technology companies. Societal collapse and internal strife? Now there’s a prophecy waiting to fulfill itself any day now. And yeah, we’ve been skating on thin ice for most of the time I’ve been alive, but the situation’s getting tense. Or is there some other option I’m overlooking? Restricted thinking is the hallmark of a disturbed individual, after all. But even when I put this question to others they seem to offer nothing in the way of helpful advice. I’m tired of choosing between cannon fodder, Cassandra, and collaborator. I want a new role that can actually make a difference. Another thing that’s bothering me is the fact that with everything that’s going on in this world, I’m spending money and time on something like a gender transition. I feel guilty because it seems so frivolous. What is gender anyway? Why do I feel the need to do this when I know the whole concept of gender is a silly social construct? For that matter, why does anyone? It seems like another pointless materialist distraction born of consumerist boredom and not of any real thought or necessity. At times I really disgust myself for not putting my gender angst aside and investing that money in something more worthwhile. I don’t want to be remembered as a selfish person who never did anything worthwhile for humanity. I don’t want to be ignored until it’s too late. I don’t want to waste my life for a dubious outcome. I just want to know that there is something I can devote all of my energy toward that will work. On this day 99 years ago, British and German troops on the Western Front put down their rifles for a moment and celebrated Christmas together in the trenches in a series of informal truces called the Christmas Truce. I feel like I should say something else about it, but I’m at a loss. John wasn’t there; he was either in Shrewsbury or in Hereford, seeing his family for perhaps the last time. But it seems wrong to leave an event like that with nothing but a neutral description. For what that moment represents about the human condition, about how deep down we’d rather celebrate holidays than fight each other, says volumes about the acts of righteous disobedience we’re capable of. Maybe this didn’t end the war, but it stopped the killing on both sides for one precious moment and someone, somewhere, is a grandchild or great-grandchild of a soldier whose life was spared that day. I wonder if they know that they are alive today because a bunch of soldiers disobeyed orders en masse. Sometimes, fighting the good fight means not fighting at all. Never forget that. Generally, there are two dominant narratives on death in our culture. The first says that the body separates from the soul, and the soul passes into either an afterlife or reincarnation. This is the dualist position of the separate body and soul which is common across cultures. To this view, the near death experience is a witness testimony to the existence of Heaven (and more rarely, Hell). The second narrative says that what we call the soul is a function of the body, and is no more reborn than a computer is reborn after its hard drive is wiped. To this view, the near death experience is the result of a recently-discovered phenomenon in which the dying brain releases massive amounts of a potent psychoactive compound called Dimethyl Tryptamine (DMT) and sends the brain on a goodbye trip before shutting down completely in a final wave of terminal activity. But what if the evidence of these two positions was less contradictory than we presumed? Where would you find any sort of common ground between them? The answer, to me, is in the DMT. What I have discovered, however, is that the quality of insight you have will be directly proportional to the quality of what your mind is focused on. Obviously, you’re not going to have an epiphany getting stoned while watching old reruns of Ren and Stimpy stuffing your face with Cheetos. Garbage in, garbage out. If you give your mind shits and giggles, you will get only shits and giggles, but if you give it something profound to ponder, then you’ll find you are a more insightful being than you ever knew. It is the door, but not the path. Now consider this: psilocybin (along with LSD) is a DMT analog. It produces much the same effects. Also consider that the sort of tranquility and acceptance required for a psychedelic experience is much like the frame of mind proposed in the Bardo Thodol (or Tibetan Book of the Dead, as it is known in the West). *That Timothy Leary was correct in finding a parallel between the psychedelic experience and the Bardo Thodol, even though it was not known in his time that the dying brain releases DMT. *That psychedelic drugs could induce the state of readiness for transcending and understanding death and rebirth, though not enlightenment itself. *That we know of Heaven from those who have passed through a positive Bardo state because they had the correct set and setting when they died. *That we know of Hell from those who passed through a negative Bardo state because they died fearful, unprepared, or consumed by guilt. This last point seems to be borne out by my memories of how John felt after death, in a confusing morass of form and shape coupled by an unpleasant and frightening sensation of moving simultaneously in a thousand directions without going anywhere. I have spoken to others who remember passing through something closer to an NDE description of heaven, and this would also explain the small but significant number of people whose NDEs provided a Hellish experience. Those who are uncertain about their personal beliefs or are killed in bad situations (like, say, a muddy trench in France) would be the most vulnerable. There is one problem with all this that I’m trying to hash out: what happens in violent deaths where the brain is destroyed before you can have any sort of trip, good or bad? Would it lead to a confused Bardo state? Is this where hauntings come from, perhaps? This is important because so many of those killed in the Great War were simply blown to pieces too small to gather. If the body and soul are a dual entity, then it would stand to reason that the soul would leave a body quite forcefully in that case, but without the chemical guide to map things for their dying minds, how would it know where to go next? Would they even know they were dead? The hypothesis is imperfect and relies on a lot of suppositions, but it is interesting to consider the parallels between Buddhist conceptions of the afterlife, the psychedelic experience, and the scientific evidence of the dying process.